Considering how cold the winter is where I live, I could certainly use the Real Fireplace Illuminational Heater right now. 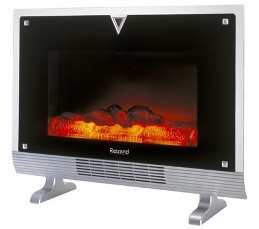 The Real Fireplace Illuminational Heater was developed in Japan, and I am told that they have some pretty cold winters. In fact, many apartment dwellings in Japan are not well insulated and do not have fireplaces. It appears that this device solves both of those dilemmas. You can clearly see how this device creates a realistic flatscreen display of a fireplace. It certainly is much better than those fake fireplaces with the rotating red and yellow light underneath some fake plastic “ashes”. Personally, I think that it is nice to have a fireplace, but it would be highly impractical and costly for me to install one just for aesthetic reasons. Now I can add a more romantic feel to my place without having to worry about getting firewood or that awful smoke blowback problem. It doesn’t sound like you can download any other image into the screen. However, this is not designed to be a television set, but a spaceheater that puts out heat where you need it the most. And if you’re like me, you could always use a little more heat. Unfortunately, you can only get it in Japan for just 25,800 yen, or $242. Too bad, because I sure could use it.